Drilling the hole sized up to 40mm in dia. and 800mm in depth in concrete and installing services of Dowelled-bars; Chemical & Mechanical Anchor bolts into re-inforced concrete elements carried out by a professional and well-trained applicators at high responsibility. 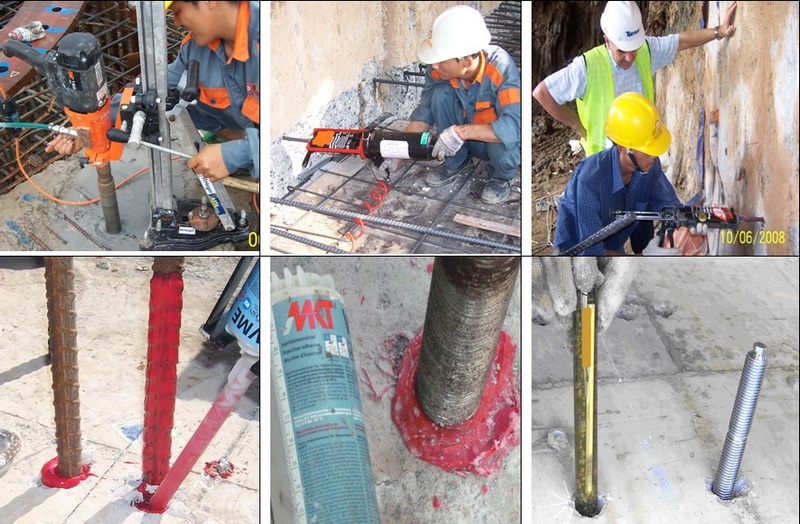 Especcially we can also conduct diamond-coring to cut through rebars inside re-inforced concrete with big holes sized up to 200mm in diameter and >1,500mm in depth. I want to have starter bars in existing concrete elements, how can I make it safely? I want to have a chemical anchor bolt to fix a structural steel frame, how can I make it?